Thankfully it is too soon to tell whether (at least in my case) this is myth or legend, but some time ago I heard that if you introduce three couples who eventually marry, then you get to go to heaven. With the marriages of Jody Costilo to Michael Gan, my sister Abby Strongin to Andy Cherner, and my cousin Catherine Kreindler to Tim Levy, my prospects for the afterlife are looking pretty good. This past year, a hat-trick of another sort happened and it has me wondering. If not one, not two, but three people are named after you, what’s the reckoning? In mid-2009, Henry Clark Dunning Goldblatt was born to two superhero-loving parents who thought it fitting to name him after a couple of superheroes they admired, our own Henry Goldberg and Clark Kent a.k.a. Superman. I may or may not be bound for heaven but I have no doubt that Henry is part of a fantastic troupe of superheroes engaged in some serious merry-making. Batman is the best as far as the Strongin/Goldbergs are concerned. 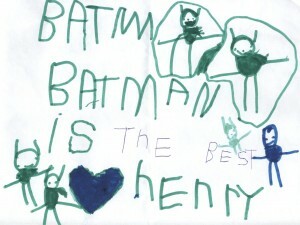 As you probably know by now, Henry was fascinated, even obsessed, with Batman. He wore Batman costumes in sizes that grew with him, from infant to medium. He owned – and played with – hundreds of Batman action figures. He wore capes, utility belts, sneakers, watches. He watched movies, cartoons, and read comic books. Among the best days of Henry’s life was the day he met the real Batman. Recognizing my dual love for Henry and all things Batman, Allen is ever on the lookout for new collectibles. This holiday season, he hit the jackpot. 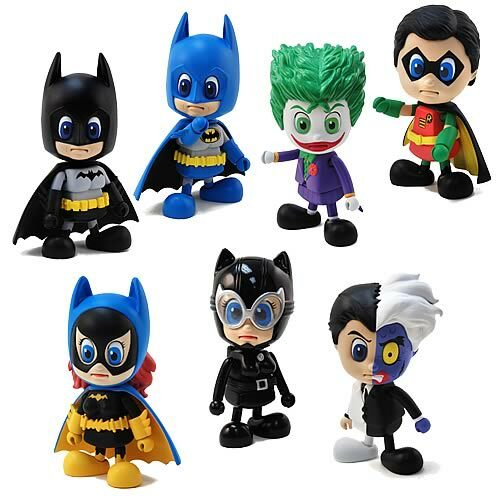 Entertainment Earth, which is a purveyor of amazing Batman goodies, advertised its Batman Cosbaby Mini-Figure Set, seven three-inch high, posable action figures including Batman, Robin, Batgirl, Two-Face, and the Joker. The whole gang quickly moved from package to dresser display. Last night Joe asked me if he could sleep with the Batman and Robin figurines. He held them as we lay in his bed and explained, “Batman is the best. He is stronger and he has better protection on his chest, his head, and his wrists. He is my favorite.” Then he paused and added, “But Robin has cooler eyes because he wears eye black.” For those of you who are not baseball enthusiasts, eye black is grease worn below the eyes of baseball players to help reduce glare from sunlight or stadium lights. For Joe, an aspiring baseball player, this was clearly a plus. David Shenk, an author of many books including the soon-to-be-released The Genius in All of Us, blogged about Henry, Allen, and me on the seventh anniversary of Henry’s death.